GoLite Jam 2 Ultra-Lite Backpack - Fantastic! Never go back to the bulky, heavy packs. This pack rocks, though you have to be into the ultra-lite approach to make it work as a true hiking pack. 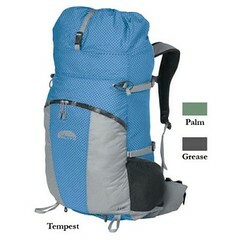 But I also use it for day hikes--at 22 oz., it's lighter than my other dayhike packs. 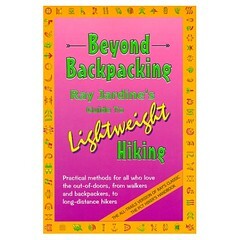 I caught the ultra-lite bug while reading Ray Jardine's Beyond Backpacking, which is infused with the ultra-lite philosophy Jardine preaches. Indeed, hiking the "Ray Way" has become something of a religion among ultra-lite purists. I just think the guy makes sense. Why lug 50 pounds of redundant gear on a hike and make yourself miserable? When done right, traveling lighter is safer and more enjoyable. Amen. At 22 oz., this pack is truly ultra-lite, but also amazingly strong. I like having the zippered front pocket for snacks, etc. And the two side pockets hold water bottles at an accessible angle, though the pack does also have a hydration sleeve that will accommodate about 3 liters (bladder NOT included). The GoLite Jam 2 has few other frills, which keeps it light, light light, but here's a list. "GoLite�s ComPacktor system" - bottom anchor clips convert the multi-day pack into a day-tripper; I use this feature a lot. Distributes the load better, keeping it closer to the body. The GoLite Jam 2 backpack is a wonderfully versatile pack. I use it for just about every outing, short or long. Highly recommended. NOTE - Though I'm a small guy, I bought the large size. The small was just toooo small.